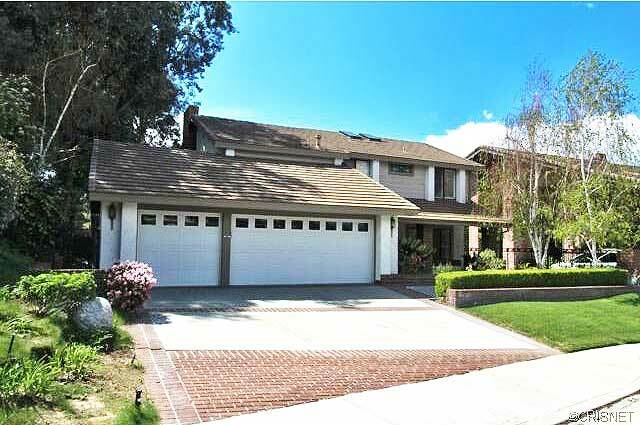 Check out this new listing at 25463 Via Acorde, Valencia, CA, 91355 added on 03/27/2014. This is one of the many lovely homes in the heart of Valencia CA real estate. One of the many Santa Clarita homes for sale, this great home is located in the popular and lovely Vista Ridge tract in the Valencia 1 neighborhood. It has 4 bedrooms and 2 baths and 2516 square feet. Located off Wiley Canyon Road and Tournament Rd, it is close to the Santa Clarita & Valencia paseos and hiking trails as well as the Valencia golf course. Great schools. See more about schools for this home below. Beautiful cul-de-sac home situated at the 9th hole of Vista Valencia Golf Course. Private pool size lot. Home features newer heating, air and copper plumbing. Fresh paint inside and out with a wood burning stove and a gas log fireplace. Shutters, crown molding and ceiling fans throughout. Lots of natural light. Balcony deck off master rebuilt 2 years ago. Master suite is home to a wet bar with microwave, claw foot tub, and separate shower with dual sinks and built in storage. Three bay garage with built-in storage and finished attic. High efficiency washer and dryer included as well as refrigerator. Located in award winning school district. Click here for more information about Santa Clarita CA schools and the following schools for 25463 Via Acorde, Valencia, CA, 91355 – William S. Hart High School, Placerita Junior High School, Old Orchard Elementary School. This Valencia CA home for sale at 25463 Via Acorde, Valencia, CA, 91355 is located off McBean Parkway. with great access to the Golden State Freeway. This is a standard sale.